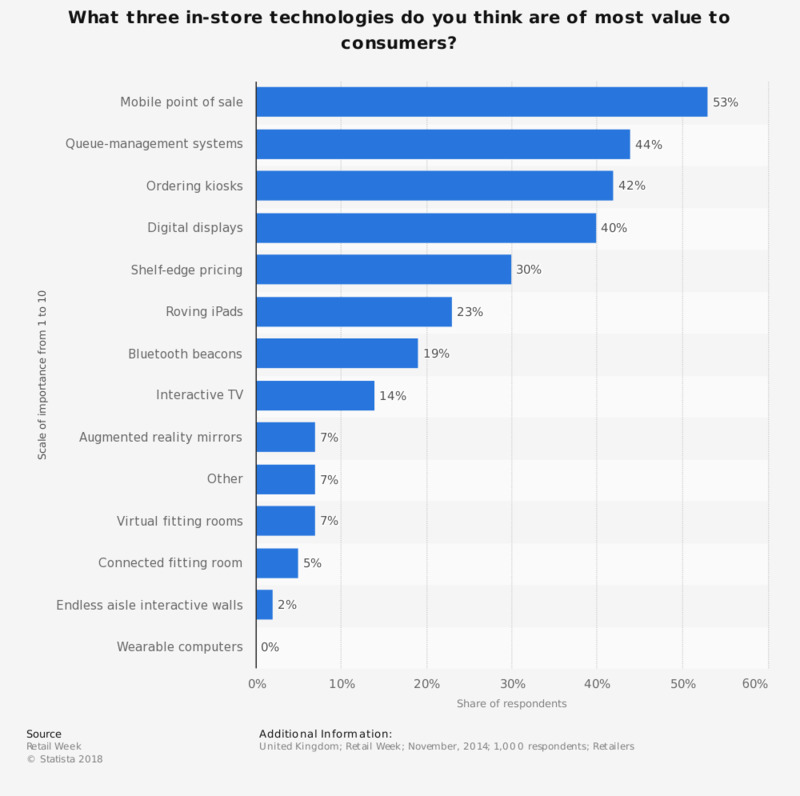 The statistic shows the results of a survey conducted among retailers in the United Kingdom (UK) in 2014, asking them which three in-store technologies they think are of most value to consumers. Of respondents, 53 percent rated mobile point of sales as one of the three most important in-store technologies to consumers. Number of retail respondents not given, however the source states that the results are "based on a widespread retail survey, in-depth interviews with those at the helm of retail store design, and the views of 1,000 shoppers". On a scale of 1 to 10, how important is in-store technology, such as iPads and virtual fitting rooms, as part of your in-store shopping experience? Which technologies are you familiar with as part of your shopping experiences? How much importance do you attach to store design in out-of-town retail parks? What in-store technologies would improve your in-store experience? Which retailers do you think have improved their store design in recent years? Do you agree or disagree with the following statement: "Large out of town shopping centres are bad for my local high street"?